“The only thing better than a good piece of art is a good piece of cheese,” says Lead Artist of Polish Interior and Art Design, Christina Greive, while finishing up a custom painting for a client. When Christina enrolled in art school, her original plan did not include creating a design firm. Fast forward 10 years and now she’s co-owner of Polish Interiors, creating custom art, networking with other local artists and expanding her personalized touch into the design of every client’s home and business. If you were to take a tour on the artwork of Greive, you would see an array of mediums, colors, sizes and inspiration. “My ultimate goal is to create a work of art that combines a client’s unique style, my aesthetic and at least an inkling of sentimental value. 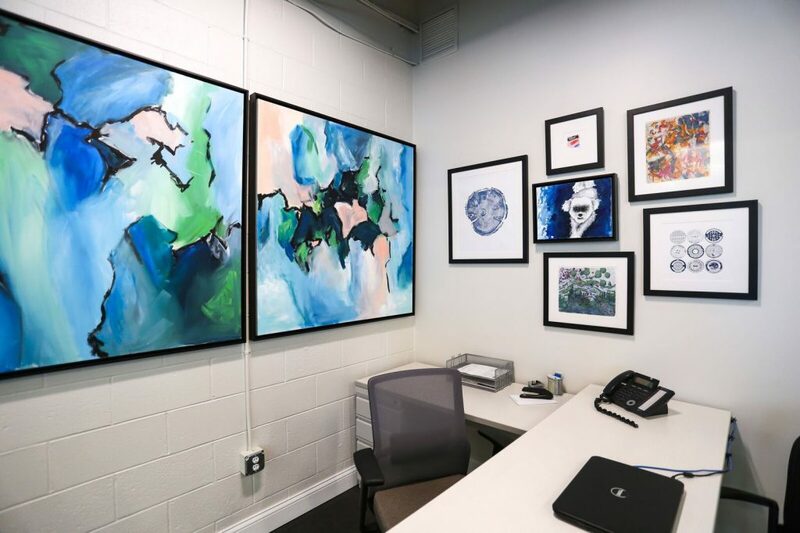 Recently, I completed a ‘wine and canvas’ project in which a family of five came to our studio and each created an abstract work of art. Canvases and color options were prepped to insure a cohesive design would prevail, but honestly the sentiment associated with the end product was what made this my favorite project thus far.” Greive says. For your next custom art or interior design need, Polish Interior and Art Design has the experience and excitement to collaborate with you, your family or business! Be sure to check out their Instagram @polishinteriorandartdesign, visit them online at polishinteriors.com or give them a call at 812-653-1125.